Rich Razzleberry, Basic Black & Pumpkin Pie!! I had to stretch my creativity because I don't have any of the fun new Halloween sets and these colors say Halloween to me. Actually, I think I only have 2 Halloween sets period! For some reason I didn't order any this year. Oh, well! I made do and really like how this one came out. 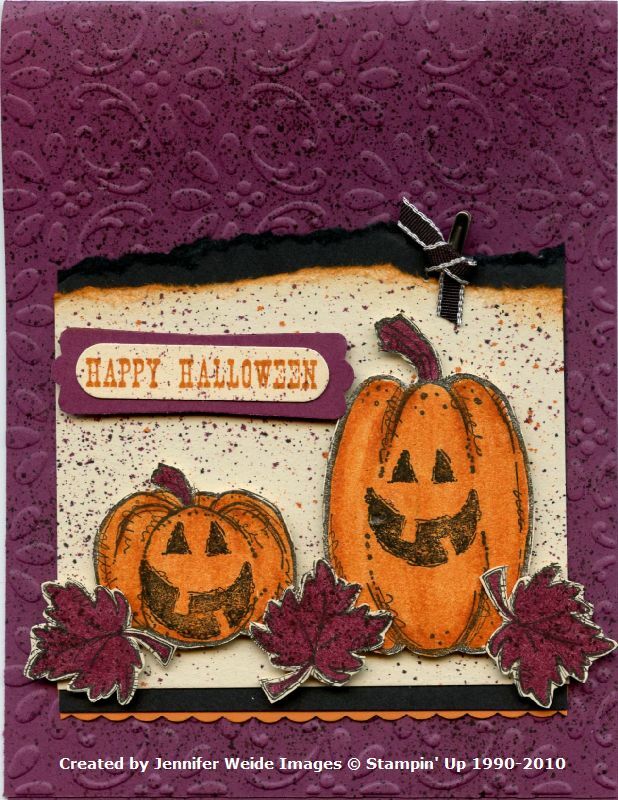 While studying my catalog and debating between this set, Autumn Harvest, and the other set I have, Batty for You, I decided I liked the layout of the sample card with the Autumn Harvest set (page 27) and decided to run with that. Card base is Rich Razzleberry and the front was textured in the Big Shot with the Finial Press embossing folder, then spritzed with Basic Black & Rich Razzleberry. I stamped the two pumpkins and 3 leaves in Basic Black on Naturals Ivory, colored and cut them out. The leaves were spritzed with a little bit of Basic Black. Behind the image is a piece of Naturals Ivory that was spritzed with all 3 colors. I attached the pumpkins and leaves with dimensionals. Next I added the saying at the top also with dimensionals, Happy Halloween from All Holidays. The words were stamped in Pumpkin Pie on Naturals Ivory, spritzed (of course!!) with Razzleberry, and layered on a Modern Label of Rich Razzleberry. After everything was on the Ivory panel, I tore it across the top above the saying and images and sponged the torn edge with Pumpkin Pie. Then I layered it onto a piece of Basic Black, the same width but left an accent strip at the bottom. Across the top I tore the Black and tried to match the "pattern" to the Naturals Ivory. At the very bottom of the Basic Black is a strip of Pumpkin Pie showing, punched with the Dotted Scallop Ribbon Border punch. I attached this decorated panel to the card front, and added a Mini Library Clip with a piece of 1/8" Black Taffeta knotted around. My explanation seems complicated, but it wasn't to make. It went together very well and didn't take a very long time! Thanks for stopping by, I hope you'll drop by the ColorLab and play along!! Great colors to work with -- your card is adorable! Wonderful details. Great Halloween card -- fabulous use of the colors! Great card. I love the distressed and sponged edging. Beautiful card, Jennifer! Love the colors.